This anthology is the first to survey the full range of modern Japanese drama and make available Japan's best and most representative twentieth- and early-twenty-first-century works in one volume. 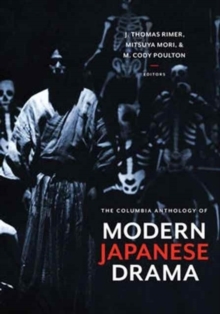 It opens with a comprehensive introduction to Meiji-period drama and follows with six chronological sections: "The Age of Taisho Drama"; The Tsukiji Little Theater and Its Aftermath"; "Wartime and Postwar Drama"; "The 1960s and Underground Theater"; "The 1980s and Beyond"; and "Popular Theater," providing a complete history of modern Japanese theater for students, scholars, instructors, and dramatists. The collection features a mix of original and previously published translations of works, among them plays by such writers as Masamune Hakucho (The Couple Next Door), Enchi Fumiko (Restless Night in Late Spring), Morimoto Kaoru (A Woman's Life), Abe Kobo (The Man Who Turned into a Stick), Kara Juro (Two Women), Terayama Shuji (Poison Boy), Noda Hideki (Poems for Sale), and Mishima Yukio (The Sardine Seller's Net of Love). Leading translators include Donald Keene, J. Thomas Rimer, M. Cody Poulton, John K. Gillespie, Mari Boyd, and Brian Powell. Each section features an introduction to the developments and character of the period, notes on the plays' productions, and photographs of their stage performances. The volume complements any study of modern Japanese literature and modern drama in China, Korea, or other Asian or contemporary Western nations.